Projects – Beth MacFawn Landscape Design Inc. This home is situated along Bozeman Creek. The homeowners desire for a low maintenance landscape while complimenting the existing natural environment led me to design a creative landscape using perennials, grasses, shrubs, and trees. An outdoor patio for entertainment, with a fire stand, and a stone retaining wall were elements which were incorporated into the design. Raised steel containers were used for vegetable gardening, set within a granite base. The pictures shown here show the first season for this new landscape. This designed involved creating an outdoor space for entertainment for the homeowner’s large family, and included a fire pit, to enjoy during our cool summer evenings. Stone treads were utilized for the grade change and provided a smaller, separate seating area behind them. The edge of stone walk and patio created planting spaces for native perennials and grasses. The pictures show this project a month after installation. This house had been newly built in a historic district in Bozeman. The need for privacy screening provided ample opportunity to create a sense of enclosure along a busy street, while creating spaces for year round interest. The play space for children in the backyard, with a vegetable garden, allowed safety for the kids as well as ‘hands on’ learning; growing vegetables in the garden beds. This space was created for tranquility for quiet contemplation, meditation, or group discussions, located behind Bend Beyond Yoga Studio. Several elements of a Japanese garden were incorporated into this unique space: A simple water feature providing a gentle sound of water, and hand selected sandstone used as standing stones to give a sense of history, and the passage of time. The center quadrant made of granite, honor the four directions. This formal vegetable garden was designed around the owners desire to grow and harvest their own fruits and vegetables. Based on the “Square Foot Gardening” book by Mel Bartholomew, Beth designed 7 raised 4’x4’ planters, built out of cedar, and utilized granite block as a toe kick. She also incorporated a longer planter to be used as a moon garden. The granite was obtained from an old quarry on Homestake Pass, outside Butte. This large, 55 square foot, enclosed vegetable garden provides an oasis in the desert, with pathways, ample garden spaces for apple trees, raspberries, strawberries, peas, asparagus, peppers, greens, tomatoes, herbs, potatoes, lilacs, roses and spring bulbs. A custom designed deer/rabbit proof fence was installed to prevent wildlife from enjoying the ample produce, and compost bin was built within the garden. Custom greenhouse covers were built to extend the growing season, in spring and autumn. This location can be very windy and extreme temperature fluctuations throughout the growing season, so these double walled polycarbonate frames protect and provide additional warmth for seedlings. The two sided roof of greenhouse covers fold down, and the opposite sides can be removed during the hot summer months. In the fall of 2012, I was leaving a job site in Big Sky when I received a call from Community Design & Architecture, based in Oakland, California. They asked if I would be interested in being on their design team for the EPA’s “Greening America’s Capitals” project, for Helena, Montana. They interviewed me over the phone, and said they’d get back to me within the next week. I was delighted to be offered a position on the team, and enthusiastically accepted. Our first task was to submit our qualifications and technical approach to the EPA. There were four other teams submitting applications; fortunately, our team was awarded the project. Greening America’s Capitals is an EPA program to help state capitals develop an implementable vision of environmentally friendly neighborhoods that incorporates innovative green infrastructure strategies. Helena also wanted to improve traffic flow, create safer crossings for pedestrians and bicyclists, and improve the connection between historic downtown and the newer commercial district to the north. This design process involved walking around downtown Helena in January with the other members of the design team. We defined several key intersections to focus on and began creating schematic designs, incorporating rain gardens, permeable paving, bike lanes, and stormwater swales. Adjusting vehicle traffic to create a pedestrian and bicycle friendly experience was also an objective. I worked with the other members to ensure that the landscape design and other design elements and concepts properly and creatively considered the local eco-region, cul­ture, and economy of Helena. We had a three-day design charrette with Helena City officials, as well as with business owners and residents. We also gave two public presentations, from which we received ample feedback. Based on the feedback from these meetings, we revised the design schemes, and provided the final report. Helena can utilize this report for funding and grants to begin to implement these design ideas, which include green infrastructure and native plants. 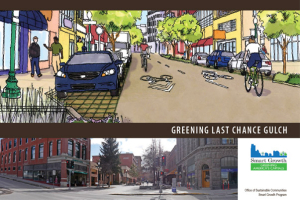 I am looking forward to visiting Helena over the years and seeing these green infrastructure ideas become reality. 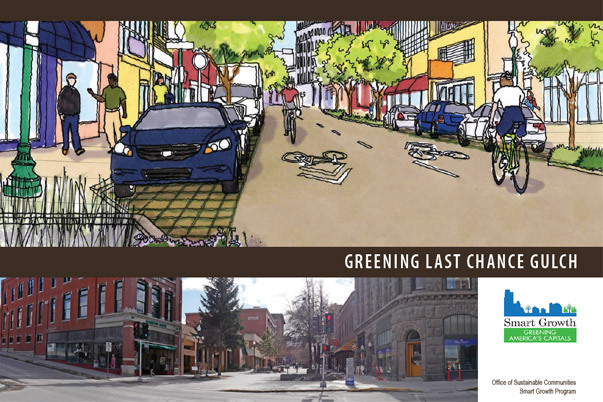 You can see the final report on the EPA’s website, or here: http://www.epa.gov/smartgrowth/pdf/greencapitals/helena-greening-last-chance-gulch.pdf.